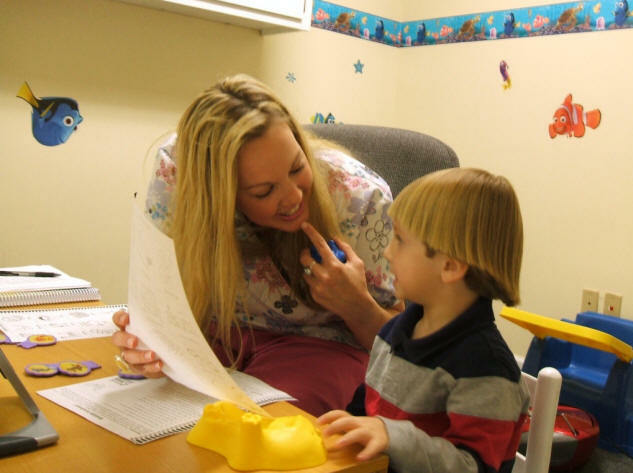 Pediatric Speech Therapy is the corrective or rehabilitative treatment of physical and/or cognitive deficits/disorders resulting in difficulty with verbal communication. This includes both speech (articulation, intonation, rate, intensity) and language (phonology, morphology, syntax, semantics, pragmatics, both receptive and expressive language, including reading and writing). Depending on the nature and severity of the disorder, common treatments may range from physical strengthening exercises, instructive or repetitive practice and drilling, to the use of audio-visual aids. A child’s communication is considered delayed when the child is noticeably behind their peers in the acquisition of speech and/or language skills. Sometimes a child will have greater receptive (understanding) than expressive (speaking) language skills, but this is not always the case. Treating your child includes examining, evaluating, and assessing the areas in which your child may have difficulty functioning and then incorporating activities to address these areas. After examining your child, our professional therapists will make an evaluation of their findings using a combination of standardized tests, observations, and/or clinical expertise. Request information about this or any other Upward program.